Extra hot today! The ice water came in handy. I think that I am going to go ahead and put some Gatorade in the freezer too. That way it will be ready for the really hot days. I saw several cyclists out today. I like watching them. Like runners, each cyclist has his/her own form. There was one today that passed by me with such smooth speed and power. It was impressive! As we nodded ‘Good Morning!’ to each other, I noticed a confident smile. I love seeing that in people! New A2B Milestone! 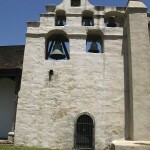 I passed the 100 mile mark at the San Gabriel Mission Outpost in Redlands, CA! In comparison to 3,600+ miles, it may not seem worth celebrating. But to me, it absolutely is! It is important to acknowledge and celebrate every milestone success. It is recognition for the current accomplishment and incentive for the next milestone. I am reminded of a few lines from the a song, “Seize The Day” from the Broadway musical, Newsies. Stare down the odds and seize the day! That’s how you win it! Minute by minute, milestone by milestone is the way to the A2B finish line in Boston. A thousand “Thank You’s” to readers, friends and family for your support and encouragement so far!